Why? There are no "J"s in the Alpha listing for maps on the site. No longer 20 terts, now 42 with pirates and colonials thrown in the mix battling for the resources. As of Version 3, there are now 42 terts. 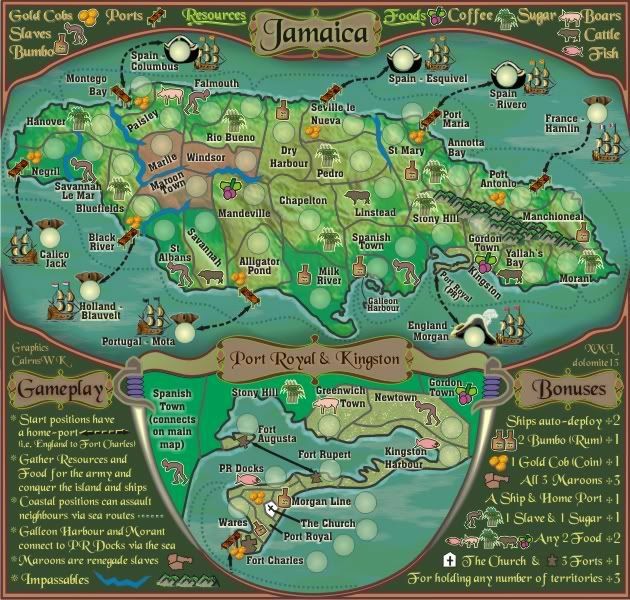 As of version 3. there are no continents but each player will start as a pirate or colonial and battle theri way on-shore to control Jamaica. 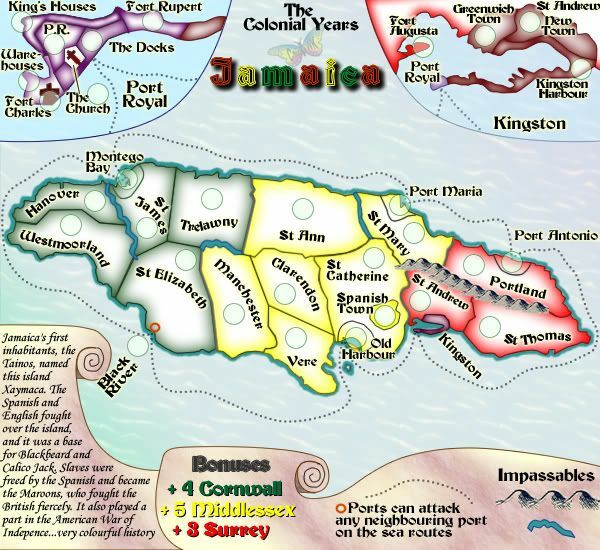 As of version 21b, It is my intention to try to get the pirates and routes more in line with historical facts, that occured before the earthquake of 1692 which destroyed Port Royal, and much of the acitivty moved to Kingston. 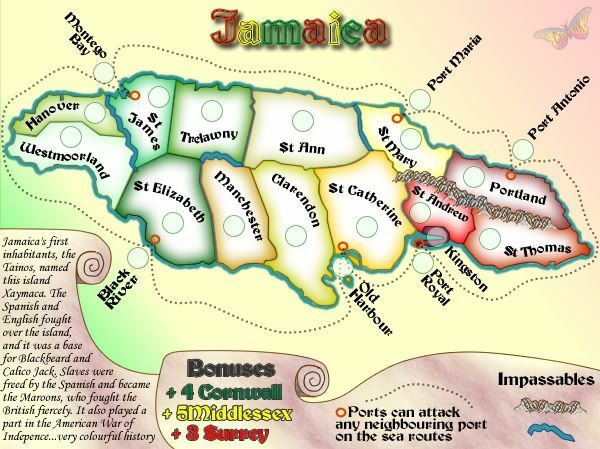 The Spanish first colonised Jamaica on the north side of the island before establihsing settlements at Spanish Town. To this extent, Spain still colonises Montego Bay, but St Anne's Bay has ben changed to Sevilla la Nueva - the name of the ifrst spanish setttlement in that region. After 1655, spain was kicked out and the British took over rule of island from Pport Royal at Fort Charles, and had several forts around the island to ward off attacks from pirates and other colonists during the various Wars that raged between European powers at various stages. 1. Henry Morgan has been moved down to have a home port of Fort Charles, because after his stint buccaneering for the British in other waters, he settled and became Govennor of Jamaica. 2. Dutch Pirate Blauvelt replaces Henry Morgan with base at Black River. 3. 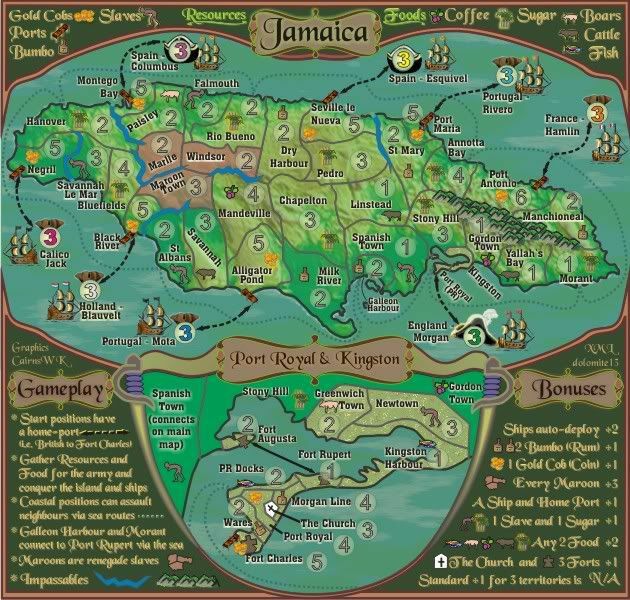 Calico Jack position was moved to Negril, because it was here that he was captured by the British before being hanged in Port Royal. (Effectively this would make his capture at Negril the end of his line in gameplay, so i beleive it is appropriate). 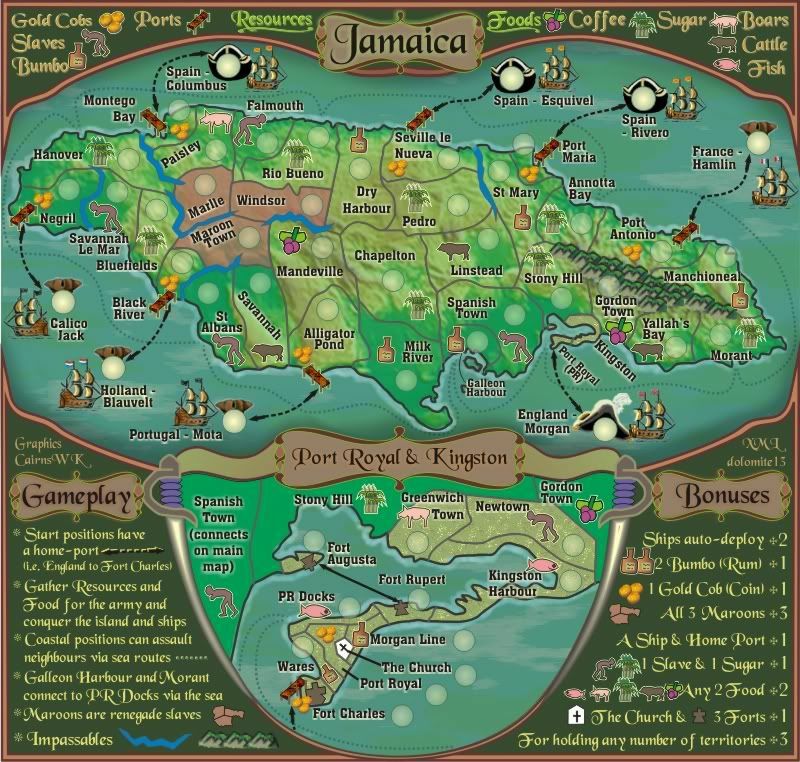 From research he never plied the waters off Jamaica as a pirate but spent more time wandering around Tortuga and the Caribbean. NB. Blackbeard was never in Jamaican waters either, so he is gone historically and replaced with the Portuguese Pirate - Mota who apparently raided the Jamaican coast regularly. 4 & 5. Spain has been given two names to colonise, so that they can assualt each other (rivalry) between Explorer and Governors. I wanted to include a colony at Spanish Town but there is no room. 6. Pirate Rivero Corsar for Spain also assualted the north coast frequently in the early days. 7. The French are still in with Pirate Hamlin, establishment of colonies was unsuccesful, Hamlin appears to have been the pirate that operated from these waters. Last edited by cairnswk on Fri Mar 26, 2010 5:15 pm, edited 66 times in total. cairns, you're a machine. You know that, right? I'd like to see the title font as solid text, rather than outlined text. Contrary to the above comment, the bonus names look really blobbed together and are bleeding. Well for one, you need a space after the yellow "+5". Secondly, I'd take out the outline altogether, and see how that looks. Same goes for the port symbols — or maybe just make the outline thicker. The difference in colors is very confusing. Very…just make them all the same color and see what you like?
. 's for the St.'s? I know it's different grammar here in the US, but for one most of the players are from the States, and two, well it just suits it better. I dunno about Jamaican grammar … anyone? For the Northern port names, do they have to be that vertical? I don't see a reason they couldn't be horizontal text. Speaking of the ports, it's a bit confusing how the names are so far away, which makes it look like the actual land territory doubles as a port. I might even try making them into boats which connect to the land territories they're on now. Get rid of the land blob by Port Harbour — it looks like Port Harbour is that little … thing. In the text: I'd put a "a" in front of the "very colourful …" for grammar reasons. Also, "the American Revolution" is both the term and saves space. Why is your butterfly so opaque? Nicely done, per usual, cairns. I don't like the idea. 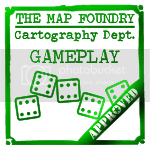 I generally do not want to see many more small and simple maps come out of the foundry. The Neon Peon wrote: I don't like the idea. 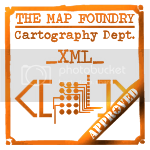 I generally do not want to see many more small and simple maps come out of the foundry. 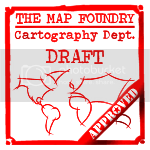 Well, i've certainly produced my share of large and complicated maps, so another small map won't hurt. I was reminded recently that the majority of players drop in for relaxation and easy games. so that's why i though this one would be good. Last edited by cairnswk on Mon Jan 26, 2009 3:35 pm, edited 1 time in total. This map definitely has potential. I'm not a big fan of the current color scheme, since it's hard for me to tell which continents are which. I basically echo most of what .44 said. 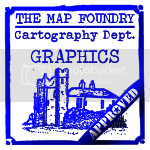 There may not be a huge demand for maps this size on CC, but one more won't hurt. I'm against the map. Unless the graphics are amazing (canada or iceland in standard) there really is no need for another small simple map. I'm not sure where I fall on this map---I can see its potential, but I'm not sure its enough. But then again, I remember being in the middle of the whole Doodle Earth debate, and eventually leaning toward giving it the thumbs up...so we'll see. But a lot has changed since that initial foray into smaller maps. AndyDufresne wrote: I'm not sure where I fall on this map---I can see its potential, but I'm not sure its enough. But then again, I remember being in the middle of the whole Doodle Earth debate, and eventually leaning toward giving it the thumbs up...so we'll see. But a lot has changed since that initial foray into smaller maps. can't you at least say one way or 'tutther for the voting i'm doing....Mr sit-on-the-fence. Port Royal and Kingston have been added as mini-maps with attacking terts inside them. Now 31 terts...map growing, but now becoming complicated. christ carins... do you ever get tired of this? RjBeals wrote: christ carins... do you ever get tired of this? No. but are you getting sick of me Rj? Might not float your boat Mr Benn, but then it might float several other people's boats. Let me see what i can do with this one! I might surrise everyone and come up with a pirate or two. but that doesn't mean that will remain that way, if the graphics are improved. cairnswk wrote: That's nicely positive. thanks. took me about 10 minutes to figure out that the port royal minimap was part of the other minimap. Not sure about that. could be cool i guess, if it;s labels better. sailorseal wrote: What is the deal? Why do people hate small maps? All small maps have the same strategy. All simple maps have the same general strategy. If you combine the two, it does not matter what the map is, the strategy remains the same so the map adds little if anything for the site. That is my personal opinion. I play on many maps and do not specialize, played a good deal of games too. If you understand strategy on France, you'll play just as well on Germany.